The Presidency of the Republic of Turkey Investment Office is sponsoring the 37th Annual Conference on U.S.-Turkey Relations, a three-day gathering taking place at the Trump hotel in Washington, DC this week. The investment office is a part of the Turkish Government, reporting directly to President Recep Tayyip Erdoğan. If the Turkish government office is funneling money to the Trump hotel through its sponsorship of the conference, Trump’s acceptance of those payments may implicate the Constitution’s Emoluments Clause barring the president from accepting payments from a foreign state without approval from Congress. In addition to the sponsor, one of the event hosts, the Turkey-U.S. Business Council (TAIK), also has close ties to the Turkish government. TAIK operates under the Foreign Economic Relations Board of Turkey (DEIK), which is indirectly under the Turkish Ministry of Trade (MOT). Minister of Trade Ruhsar Pekcan is scheduled to speak at the event. Just last month, Pekcan criticized Trump’s decision to end Turkey’s zero-tariffs status, tweeting that the move contradicted a mutual objective to reach a $75 billion bilateral trade goal. Erdoğan’s son-in-law and Turkey’s Minister of Treasury and Finance, Berat Albayrak, is also speaking. The 36th annual conference was also hosted at the hotel, just months after Trump took office. Before Trump became president, the event was held at the Ritz-Carlton. It was revealed last December that former TAIK chairman Kamil Ekim Alptekin had been charged with covert lobbying on behalf of Turkey. Alptekin’s company paid Michael Flynn’s lobbying group to investigate an adversary of President Erdoğan while concealing the fact that the Turkish government was behind the effort. He was removed as TAIK chairman in early 2018, but he remains on the board. Further blurring the line between the group that’s hosting the event and the Turkish government is the fact that Mercury Public Affairs, lobbyist for both TAIK and the Turkish Embassy, arranged meetings on behalf of the Turkish General Consul in Chicago through a TAIK lobbyist. The welcoming reception for this year’s conference was held at the Turkish Embassy. 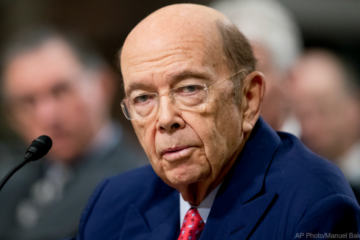 Prominent Trump Administration officials are also scheduled to speak at the event, including Secretary of Commerce Wilbur Ross, and Chairman of the Joint Chiefs of Staff Gen. Joseph Dunford. Former Secretary of the Interior Ryan Zinke is also speaking. Other sponsors of the conference also have ties to the Turkish government. For example, Turkish Airlines, which is partially owned by the Turkish government, is a top event sponsor. It has sponsored past events at Trump properties, too. In addition, the Missouri Department of Economic Development, a Missouri government agency, is also sponsoring the event. The domestic emoluments clause of the Constitution bars the President from accepting payments from any state government. While it is unknown whether any of these groups is paying Trump’s hotel as part of their sponsorships, any payment raises questions regarding the emoluments clause. Last summer, a federal judge ruled that business transactions, like payments by a foreign or domestic government to Trump properties, fall under the Constitution’s ban on emoluments.In any event, sponsoring this conference at the Trump hotel is another example of how foreign governments and their allies are using patronage of the President’s business as part of their influence strategy with the American government.